Swahili unites speakers throughout a wide region of East Africa, from Zanzibar on the Indian Ocean to Congo in Central Africa. This wide adoption makes Swahili one of the major languages of the African continent; it is an official language of Kenya, Tanzania, and Uganda, as well as of the African Union. The cultural heritage of Swahili plays an important role in the African Diaspora, making it a prominent starting point in fields of African Studies, African-American Studies, and the study of other cultures of African origin throughout the world. Knowledge of Swahili is important to governmental work, international non-governmental organizations, and international businesses. Imagine your future self as a Swahili speaker. Who could you be if you studied Swahili? Do you want to have adventures in Nairobi, Zanzibar, New York, or California? With Swahili, you could research schooling in Nairobi, negotiate a decent taxi fare in Dar es Salaam, appreciate the humor of the names in The Lion King, chat with the Tanzanian Deputy Minister of Education while traveling in Zimbabwe, or surprise Kenyans in Irvine. With Swahili, you could come up with cool examples in your linguistics classes, eavesdrop in Arusha, connect with people in Mombasa, teach your friends how to speak Swahili, or participate in online discussions. With Swahili, you could listen to Baduizm Live and correct Erika Badu’s inaccurate translations, easily learn another Bantu language like Zulu or Shona, establish rapport with East African taxi drivers in Chicago, communicate with Omanis in Muscat, make world-class professional runners from Kenya look your way when you cheer for them in Manhattan, or talk to street kids in Western Kenya. With Swahili you could hire a carpenter in Tunduma, buy train tickets in Mbeya, sell your bike at Kariakoo market, find the best nyama choma, or interview women in Lamu. With Swahili, you could wow people who ask what languages you speak, disarm and connect with salespeople, hawkers, matatu touts, police officers, and government officials, contribute to an online Swahili dictionary, teach at an American university, or give a presentation in the Congo. With Swahili you could open up a whole new worldview into art, music, politics, history, culture, food, and religion, and learn a new way of interacting with the world. Our Swahili program is particularly strong, engaging students in Swahili-speaking cultures through rich multimedia resources. We end each semester with an evening of skits, food, and music. 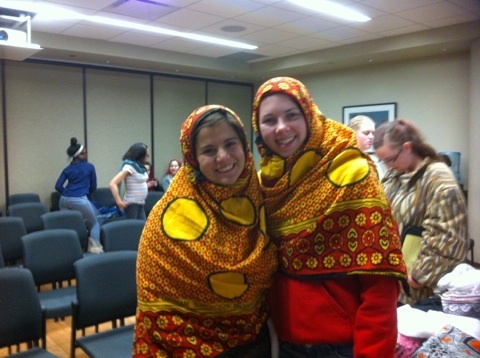 Swahili classes at UW-Madison are small. Our students are eligible for Foreign Language and Area Studies (FLAS) Fellowships, which cover partial tuition for one year and provide a stipend. 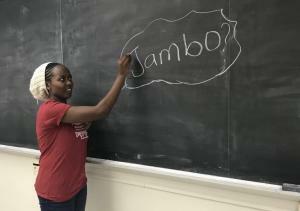 Students from our Swahili program have gone on to teach the language in New York City, New Orleans, and at UCLA; join the Peace Corps; open travel agencies; complete graduate degrees; pass the Wisconsin Bar Exam; complete medical school; and join UW-Madison as administrators, lawyers, and professors. UW-Madison offers an incredible number of study-abroad opportunities throughout the Swahili-speaking regions of Africa. For the full range of study abroad programs in Swahili-speaking parts of Africa, visit the Study Abroad website. Consult our Majors Advising Page for more information about your academic plans and study abroad.